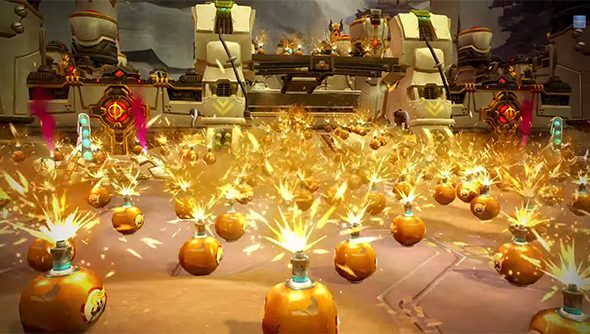 Carbine has just dumped a hot load of explosive content into Wildstar’s stunned lap, marking the MMO’s second big update since its full launch last month. The update is called Sabotage and adds a bombload of player versus player content. Here’s an excessively cheerful video from the lovely chaps at Carbine describing what they’ve done and why. Sabotage (which in my understanding of the language should always be prounounced with the Beastie Boys “SABOTAAAAGE” inflection) injects a new scrapping arena called Daggerstone Pass, in which 15 players take on 15 players in a bomb-chucking, mount-riding base capture game. The more points you control, the more airstrikes you can call in on the enemy’s base. but the infusion of bomb-madness, in which fizzling explosives can be picked up and dropped around the map to kablammo friends and foes alike, makes things rather interesting. Of course, the update sends its updatey tendrils outwards into the rest of the game, bringing new rewards and achievements and decor items to be used in the wider Wildstar world. Here’s an extensive overview of how the new game mode works. Sabotage is available from today, and the MMO itself is more than worth checking out. Wildstar is, at last count, unanimously enjoyed by PCGamesN.